Join James Ray, Senior Consultant at ICIS and instructor for the ICIS Advanced Purchasing course as he discusses global PET markets. 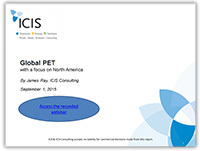 In this webinar he will cover global PET with a focus on the U.S. and Asia. Included will be the PET value chain, supply & demand balance, import & export trade flows, producer market share, as well as virgin PET pricing vs recycled PET. Would you like to talk to our training support team?